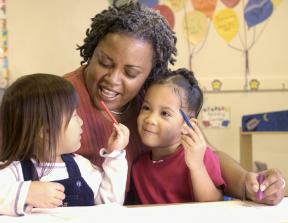 At Early Years we are committed to providing the highest quality of education. Our programs aligned with local and state standards develop confident, capable students. Each day children participate in whole group activities and individualized instructions that support their literacy, mathematical and scientific development. Every year our kindergarten program develop students competent in reading, math and writing that help lay the foundation for success throughout their school life. Literature rich with books. Children are read to everyday. to draw, paint, color, paste, design. Music & Movement - we have a wide selection of musical instruments, scarves, ribbons, music sticks, CD's for marching and singing. Science Area - equipped with magnifying glasses, binoculars, thermometers so children can explore their world. Mathematical Manipulative - to count and sort.